Four Bassin’ USA Prostaff members tested out HMG GS66MH-F rod in different conditions and environments. Each of them had their own separate experiences which you can read more about on their personal review page. The HMG GS66MH-F was definitely put to the test. Our Prostaff determined that this rod best suited for use with finesse worms, grubs, and other soft plastics up to 8 inches. Both mono and fluorocarbon line were used with weights of 6lb and 8lb. The reels used for testing were Daiwa 2500 and Shimano 2500 & 2000. Each tested the rod in various conditions; both wet and dry weather with temperatures’ ranging from 40’s to 90’s. Lake conditions consisted of everything from swampy stained water to clear rocky reservoirs. There were some differences of opinion when it came to casting Fenwick’s HMG GS66MH-F. This rod can go the distance, even in windy conditions. For the most part, it is pretty accurate when casting to targeted areas to entice fish. When using lighter weight lures, there was less accuracy when casting. If the grip wasn’t comfortable it also affected the accuracy of a cast. One of our Prostaff member found this rod to be great for skipping. The accuracy of skipping with this rod was spot on. Overall, the cast is smooth and there were no kinks or frays in the line. The design attributes have definitely aided in the sensitivity of this rod, but at the same time the slower than usual action of Fenwick’s HMG GS66MH-F may have taken some of the sensitivity away. You can detect all but the lightest of strikes, but it depends on your presentation. Those using soft plastics and finesse worm on a shaky head found it to be quite sensitive for its price range. It’s got a decent backbone for fighting fish, but it leans more towards a medium power rather than a medium heavy. The rod is strong, but it does show some signs of give through the handle when you are fighting in larger fish. The rod curves from the tip to the handle, you can actually feel the handle bend when fighting in fish 10” – 15” smallmouth bass. It was harder to set the hook on larger fish, and you could definitely feel the strain when fighting in those fish. This could be a concern if you are a tournament angler, but not so much for someone out fun fishing. Fighting fish out of milfoil and thick grassy areas was successful for the most part, but perhaps not ideally suited for this rod. This may just come down to comfort and preference. If you prefer a faster action rod, heavier lures or hard baits you might want to take a look at their heavy power rod. In order to really know if a rod is durable you need to use it more than once. Our reviewers used these rods over the course of 6 months to a year. These rods were used continuously in all kinds of weather elements. It was even used in a tournament environment where it had been dropped and stepped on throughout the day. Although the HMG GS66MH-F overall felt durable, it was noted that the rods felt a bit under powered for a true Medium Heavy blank. This was most noticeable while fighting better than average sized bass. The Carbon Veil Technology is definitely a great component here because of the higher strength-to-weight ratio. It’s used throughout the blank Fenwick’s HMG GS66MH-F. There were really no complaints here and not one of our Prostaff members experienced any major issues when it came to the durability of Fenwick’s HMG GS66MH-F. Nothing broke or cracked on the rod and it continued to perform as it had from day one. The overall consensus is this rod is extremely durable. What will long term (3-5 years) use and wear and tear bring about in a few years you’ll have to tell us? The HMG GS66MH-F handle/full front grip was not the most comfortable for everyone. The reel seat is exposed to your hand for the entire grip. This grip offers more comfort to those who have smaller hands. Those with larger hands found that the TAC, which is supposed to improve your grip, doesn’t benefit you if the grip is not fitting to your hand properly. For those who found the grip comfortable, also felt that their grip did improve during wet conditions. 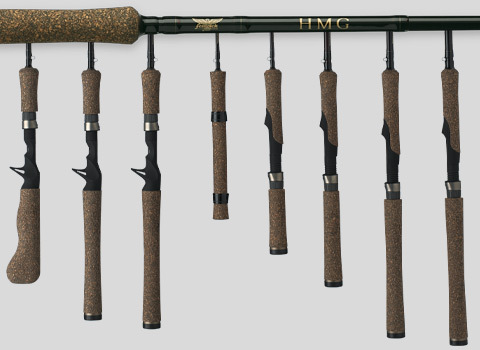 The Fenwick HMG GS66MH-F is a good soft plastics rod, shaky head or even a drop shot rod. If you are used to using a medium action rod, you may find that it will suit you as a multipurpose rod. This is a very well-constructed rod. It’s durable and you will get your money’s worth out of it since it will most likely last you a long time. As far as performance goes, there is a difference of opinion amongst the Prostaff members who reviewed the Fenwick’s HMG Spinning Rod (GS66MH-F). While this rod performed well for some, it didn’t seem to live up to expectations for others. The grip can be quite uncomfortable for some, especially if you are using a larger reel and have large hands. As strong as it is, it also did show some signs of give in the handle when fighting larger fish. However, it still did the job when pulling fish out of heavier cover. Soft plastics seem to be the best type of lures for this rod. Casting was easy, went the distance and the majority found it to be quite accurate, especially when used for skipping. It did perform well and is capable of everyday use by the average bass anglers, however the more serious angler would probably prefer spending a bit more money for one of their higher end rods. The Carbon Veil technology and TAC are really added benefits to this rod, and are solid components to the HMG GS66MH-F. If you like medium heavy actions rods that have some give, definitely check it out, but take some time feeling out the grip. If you are not comfortable with the grip you most likely won’t be catching a lot of fish with it.